I hit the dreaded plateau earlier this week and it was the most annoying damn thing I have ever experienced. I started the keto diet on Sunday (5 days ago) after the most spectacular cheat meal at Yauatcha, Kolkata – it was spectacular because it didn’t hamper my weight loss at all. In fact, I didn’t put any weight on from the meal. If you’re after a cheat meal, Yauatcha and their dim sum menu is the way to go! What I didn’t know about the Keto diet was that it causes constipation and I only lost 100gm in the first 3 days – this was apparently totally normal which I found out later after making the catastrophic mistake of taking a laxative to ease my constipation. Now, I’ve never taken a laxative before and I’m guessing the combination of my daily psyllium husk intake and the laxative didn’t bode very well together which then resulted in a full day of vomiting, high fever and crazy fatigue. Considering I was unable to walk from one room to another in my apartment, going to the gym and achieving my daily 10k step count were completely out of the question. I even went as far as telling my family that I loved them because I didn’t think I would make it past the day. But here I am, next day, fit and fresh (most importantly: not dead) and a surprisingly 2.3kg lighter. So, while the laxative day was one of the worst things I have ever experienced in my entire life, it helped in one way and that’s because it helped me to jump past the plateau and back into fat burning mode. Should you take a laxative again? Don’t even think about it. I’m so proud of myself for getting this far because I’ve never lasted this long on a diet and workout regime before. In the first 3 weeks, I’ve managed to lose a whopping 5.6kgs (12.35lbs) and it’s really starting to show on my body. I have, however, started to plateau and I’ve barely lost any weight over the last 3 days it’s time to change some things around! Starting from Sunday – which is Day 25 – I will be moving from a Low Carb Diet (LCD) to a Keto Diet for 28 days straight with absolutely no cheat days. This also means that I will be saying goodbye to my great friend, Carbohydrates. I’ll be exploring the differences the existence of carbs in a diet makes over the next four weeks to see what works and what really doesn’t work. I’m so excited for this change because I’m part of a keto and LCD diet group which posts these delicious recipes and stuff all the time but they’re mainly keto recipes and I’ve been on LCD. My body and I are totally ready to introduce chicken and almonds into the diet. So, until next time (when I will most definitely be complaining about my yearning for rice), keep grinding, fit fam! Day 15 – Transformation Challenge – Popeye doesn’t know what he’s talking about. So, I fell off the grid for a few days (nearly two weeks – my bad) but I’m happy to say I did not fall off the wagon! The first two weeks have been gruelling and tough but I have persevered and I’ve managed to lose a jaw dropping 4kgs (8.81lbs)! I’m happy about the weight loss and I’m excited to continue on; however, I want to take this opportunity not only to revel in the successes of my first two weeks, but to also address the real side of this process that most people don’t talk about. People undergoing transformation challenges usually post the like-worthy pictures on social media. The beginning and the end products do not portray the hard times that individual has endured to reach their final goal – that’s if they reach it at all. I fell off the grid over the last couple weeks because things got hard for me. 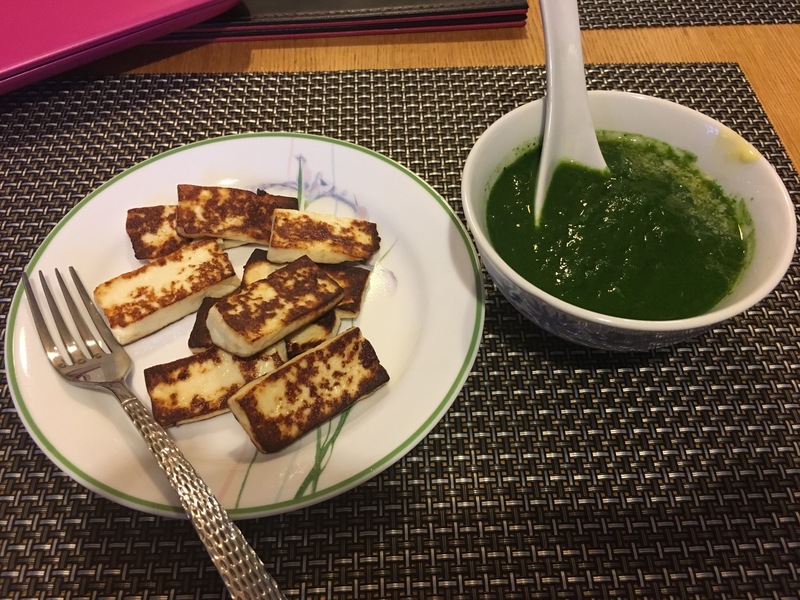 While I was full all the time, my body craved more spice, fat and things that generally tasted better than light curries involving spinach and paneer. I quickly realised my hatred for spinach and that negative feeling only grew with intensity as the week went on. This hatred for something so insignificant started to take a toll on my mood from the time my first meal came to my plate until the time I went to sleep. 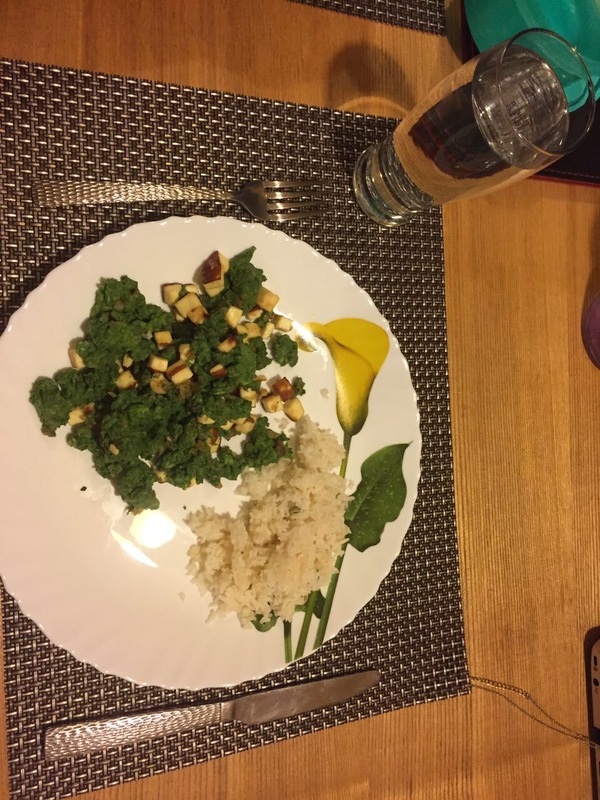 Meal time had gone from one of my favourite and exciting times of the day – as mother and I tried to make the most of the few ingredients I was allowed to use – to one of the worst due to the constant appearance of my mortal enemy: Spinach. My only salvation during these days was the 4-4.5 hour period in the mornings of intermittent fasting when I focused solely on the gym and walking 2-3,000 of my 10,000 daily prior to breakfast. I didn’t have to think about food then – it was only about getting that weight training done. This mood slowly took over my life – I retired to my room for the majority of social gatherings. I became accustomed to staring at the ceiling fan or being comfortable with being by myself. I did not want to be around my friends or my family. Netflix was my only best friend and writing was no longer an option as my words only brought out angry suffocating tears that I didn’t understand. Things were going from bad to worse when I contacted my trainer and asked for an alternative to the daily torture of tasteless spinach. It turns out, he’s not a big fan of the leafy vegetable himself! He told me I could replace the spinach with fenugreek, lettuce or broccoli. I have never run to the market so quickly in my life. Broccoli, lettuce, fenugreek and I are all in a wonderful, loving relationship now. Things are going well and I don’t foresee a separation or divorce any time soon. Let’s hope it stays that way. TL;DR Spinach is my nemesis. Dieting puts me in a bad mood. I have a weird relationship with my vegetables. I’ve decided to update the blog the morning after each day so I can include my new weight each day! Day 1 yielded a loss of 700gm which I was amazed by but day 2 shocked me more as I dropped a further 900gm which has brought my total weight down to 95kg already! That’s a 1.6kg loss in two days. This weight loss is giving me hope that I might just be able to reach my goal in the three month period after all and that hope is just giving me more motivation to keep on going. Let’s talk about day 2 a little bit. Having spoken to my trainer, I’ve started Intermittent Fasting which requires me to wake up and not consume any food for the first 4 hours of my waking day. Sounds difficult? Surprisingly, it’s not at all. With my current schedule, I wake up and chill out for about 30-45 minutes before getting ready to go to the gym. I spend approximately 2 hours working out – this includes the 10 minute walk it takes to get there and to come back. I spend the 4th hour at home – showering, making sure all vitamins have been taken and just revelling in the weight I’ve already managed to shed (due to the pre-gym daily weigh-in). That’s 4 hours done and I can indulge in my diet prescribed breakfast. So, this fasting business isn’t hard at all and by the time it comes round to breakfast, I’m so pumped from working out and revelling that the meagre amount of food prescribed seems like way too much! Let’s talk a bit about these meals though – I’ve been blogging, snapchatting and instagramming all the foods and you can see that quantity-wise, they aren’t much – however, I don’t know if it’s the repetition of the same ingredients or the drastic change in diet but my body is comprehending these amounts as too much. I get bloated after every meal which gives me the uneasy feeling that I’ve overeaten and last night, I was only able to eat half of the egg fried rice I made for dinner. My trainer says that, due to the diet being put together based on macros, I need to consume the entire specified amount – it looks like this is something that might be a struggle but I’m going to work through it the best I can! As I said, I am more motivated now after the results of the last two days than I have ever been in my life. In terms of the weight training exercises I’m undertaking, I’m following the High Intensity Volume Training (HIVT) programme put together by SQUATS on the BodySpace app. You can follow me on the app which is available on iPhones and on the Google Play store. It’s a social fitness app which means we can see each other’s tracked workouts and changes in weight. It also gives you fun stats like how many weights you have lifted whilst using the app. It’s a bit hard to figure out how it works at first – especially with finding the workouts and stuff, but if you do get it – add me and I’ll be happy to help! So, my work out on day 2 was gym time doing the “20-39 Female Fat Loss – Day 1- Upper” on Bodyspace which included 20 minutes of cardio followed by 55 minutes of weight training. The training included push ups, side lateral rises, dumbbell bench presses, tricep dumbbells, bent over two-dumbbell, alternate hammer curls, hyperextensions and air biking. In total, I did 22 sets of 9 different exercises using the app but because of the level of motivation I had, I decided to add a few extra bits – seated rowing, lat pulls and a good ol’ chest press. I like to top off each gym session with a few minutes on the vibra plate to really relax the muscles I have definitely just overworked. 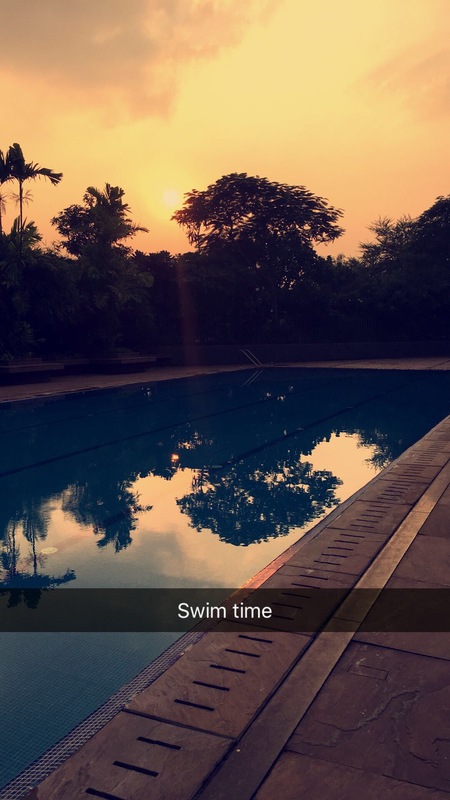 In the evening, I went swimming for 1.5 hours with my sister. We usually start the session with a few laps of freestyle and breast stroke but spend the majority of the time in the pool playing games. It doesn’t seem like much to the outsider but when you’re trying to beat a competitive swimmer in speed during a game, your entire body gets a fabulous stretch and your muscles love the work out. Stay tuned for the Day 3 update! As promised, here’s the recipe for Green Eggs and Pan(eer) – and yes, that’s a Dr. Seuss pun. With a limited list of allowed ingredients for my diet, mother and I are trying to get as creative as possible with my meals to keep me motivated. After cleaning and boiling the Spinach, mix it in a blender for a couple minutes until it is a smooth purée. Make sure only the Spinach is blended with no additional water. Separate the yolks from the egg whites and add to the blender with the garlic paste. Blend for a couple minutes until Spinach and egg whites are a smooth green colour. In a pan, heat the butter and lightly fry the onions and paneer. Once the paneer is slightly brown and a little crisp on the outsides, remove it and the onions from the pan and set to one side. Scramble the eggs and spinach in the same pan using the residual butter left over. Be sure to do this on a higher heat as simmering the eggs and spinach will lead to water escaping the Spinach. Ta-dah! You now have Green Eggs and Pan(eer)! If you do try out this recipe, let me know how it goes and if you varied it at all! My muscles have been destroyed and I can no longer walk like an abled human. Well, I can – it just hurts so much when I do. I have completed the second day of my new weight-based workout programme and the first day of the new diet. Let me be real here for a moment – when I started this, I knew both the diet and fitness would be hard but I genuinely thought the diet would be much much much harder. Turns out, the diet isn’t that bad but the workout regime is bloody brutal. I’m not going to post my full diet chart up here because my trainer, Vishnu, draws up diet charts according to a person’s specific circumstances – this includes an evaluation of their body composition analysis, the goal in mind, previous medical history and conditions, fitness levels and dietary requirements. So unless we’re complete twinsies, my chart isn’t going to work for you – but I am going to be delightful and tell you what I ate everyday because the diet chart tells me what ingredients I can use but it’s up to me (and my mother) to get creative and whip up a masterpiece. 3 poached eggs and a spinach soup with a dash of salt and pepper. I’m allowed a specified amount of butter with each meal! Isn’t that fabulous? Before we skip on over the dinner, I had 150gm of fresh plain yoghurt after swimming with the little sis for 1.5 hours at the club. So refreshing in this heat! Green Eggs (and no ham, Sam-I-Am). 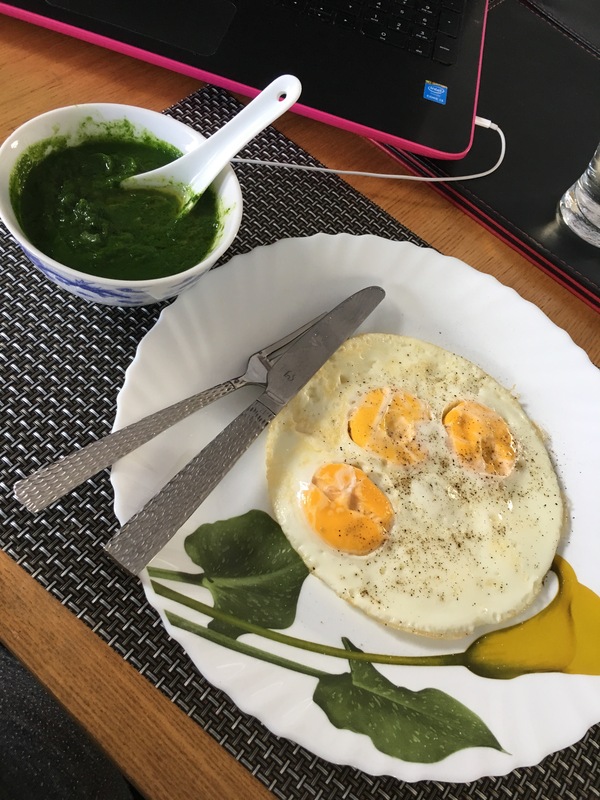 Spinach puree and eggs whites scrambled and topped with paneer and a small 30gm serving of rice. I’ll be adding the Green Eggs recipe to the blog shortly so stay tuned for that! See Day 2 of my Transformation Challenge.